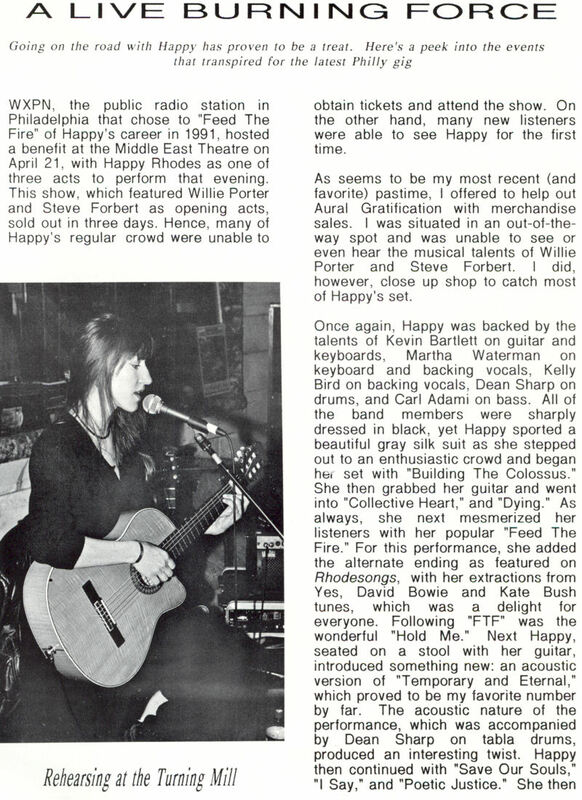 WXPN, the public radio station in Philadelphia that chose to "Feed The Fire" of Happy's career in 1991, hosted a benefit at the Middle East Theatre on April 21, with Happy Rhodes as one of three acts to perform that evening. This show, which featured Willie Porter and Steve Forbert as opening acts, sold out in three days. Hence, many of Happy's regular crowd were unable to obtain tickets and attend the show. On the other hand, many new listeners were able to see Happy for the first time. As seems to be my most recent (and favorite) pastime, I offered to help out Aural Gratification with merchandise sales. I was situated in an out-of-the­way spot and was unable to see or even hear the musical talents of Willie Porter and Steve Forbert. I did, however, close up shop to catch most of Happy's set. Once again, Happy was backed by the talents of Kevin Bartlett on guitar and keyboards, Martha Waterman on keyboard and backing vocals, Kelly Bird on backing vocals, Dean Sharp on drums, and Carl Adami on bass. All of the band members were sharply dressed in black, yet Happy sported a beautiful gray silk suit as she stepped out to an enthusiastic crowd and began her set with "Building The Colossus." She then grabbed her guitar and went into "Collective Heart," and "Dying." As always, she next mesmerized her listeners with her popular "Feed The Fire." For this performance, she added the alternate ending as featured on Rhodesongs, with her extractions from Yes, David Bowie and Kate Bush tunes, which was a delight for everyone. Following "FTF" was the wonderful "Hold Me." Next Happy, seated on a stool with her guitar, introduced something new: an acoustic version of "Temporary and Eternal," which proved to be my favorite number by far. The acoustic nature of the performance, which was accompanied by Dean Sharp on tabla drums, produced an interesting twist. Happy then continued with "Save Our Souls," "I Say," and "Poetic Justice." 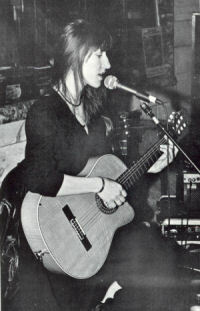 She then added another new tune, "Glory," which was very beautiful to hear live. Everyone exited the stage then and came back for an outstanding encore consisting of "Ashes To Ashes," "Cohabitants," and "All Things." After her performance, everyone met downstairs for a little chit chat. Happy was able to meet many new admirers, and entertain her friends and "family" with her usual biting wit. The next morning, the crew arose to prepare for an in-store signing at Rainbow Records in West Chester, PA, an event hosted by Advertising Manager Mike Brewer, a good friend of Happy's and enthusiastic Rhodeways member (and well, just a groovy guy). 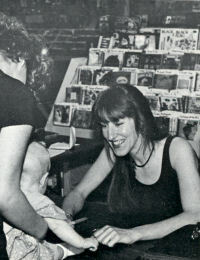 The signing took place just after 1 :00 in the afternoon, where Happy, looking cute as ever, attended to a long line of admirers clutching albums, t-shirts, and fanzines for her to sign. Happy, who should run for office with her flair for entertaining babies, was quite gregarious with everyone, and even wound up drawing pictures on a few fans' attire. The afternoon was fun and created a wonderful opportunity for everyone to meet their favorite gal. The ride to and from Philly was both long and entertaining, and included lots of coffee, goofy songs, and food launching. The entire "Rhode" crew is quite a fun group to be around. Thanks, Hap, for the opportunity you have afforded me to be part of your crew and for sharing your career and friendship with me. It's quite an honor to help out my favorite artist. Smooch!